The second half makes the first half worthwhile, so just hang in there. It pays off eventually, and deliciously. Goodman and Toby Jones are their wonderful selves, and Theron sparkles. At times, it's annoyingly vainglorious, but it's still fun to watch her fill the screen with all that oozing charisma, and she rarely embarrasses herself in the ongoing fight scenes (which is, in and of itself, a noteworthy achievement, because they are numerous, lengthy, and somewhat complex). She's too lanky and telegraphy for Bourne's krav maga, so I'm glad they opted for linear moves, some boxing and, when necessary, close-quarter wrestling and jiu jitsu. McAvoy, however, is wearing a bit thin, his two gears for the last half-dozen movies (Split among them) being salivate and strut. He needs a third gear beyond bopping around and playing British-boy-coy swagger-toy. The soundtrack is 80s killer, a score virtually non-existent (bummer), but the grainy-blue-green cinematography set in 1989 Berlin evokes a wonderful underground-dance-club-punk-rock vibe that's hip in a perfectly smoky way. 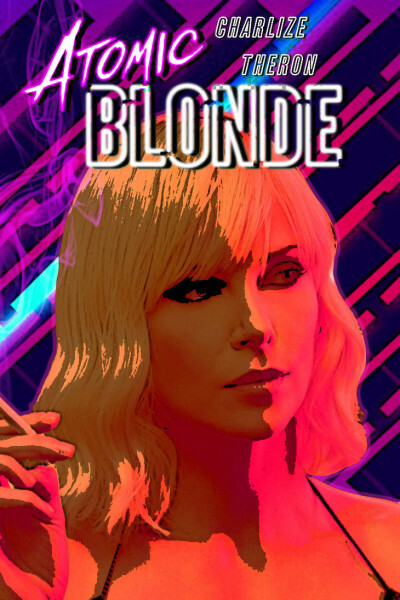 If you love action, broken noses, models who fight like John Wick, leather Chesterfield furniture, whiskey, cigarettes, brown sports cars and fashion, Atomic Blonde is screaming your name.